ISAAC News – YOU are needed on October 6! Your Presence Matters October 6! YOU are needed on October 6! The more people present, the greater our progress on creating an equitable community! “These changes will bring hope, root-cause transformations and increased opportunity to our community,” said Dr. Charlae Davis, Executive Director of ISAAC. There is no charge for the event, but donations to ISAAC are gratefully encouraged. Donations to St. Luke’s Diaper Bank are also encouraged. Disposable diapers in all sizes, wipes and diaper creams are welcome at the door. More than 1 in 3 Kalamazoo families struggle to provide diapers, which are not covered by SNAP and WIC. 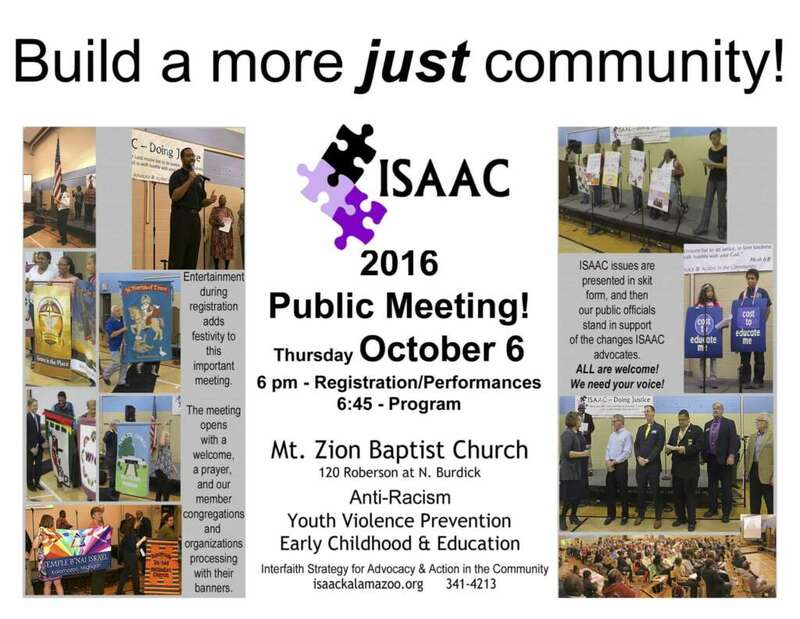 The ISAAC 2016 Public Meeting is on Thursday evening October 6, in the Mt. Zion Baptist Church gymnasium, 120 Roberson Street at North Burdick in Kalamazoo. Doors open at 6:00 pm for live music while the crowd is seated for the free program starting at 6:45 pm. All are invited. Childcare is available. Overflow parking is at the Family Health Center across the street, on the corner of North Burdick and Paterson St. See you then!